The 2019 Toyota RAV4 is a 5 passenger Automatic transmission, 2 Wheel Drive Sport Utility Vehicles or 4x4 Sport Utility Vehicles. It is available in 9 trim packages, the Adventure, Hybrid LE, Hybrid Limited, Hybrid XLE, Hybrid XSE, LE, Limited, XLE, and XLE Premium. The new Toyota RAV4 invoice price ranges from $23,844 to $33,559, while MSRP ranges from $25,500 to $35,700. 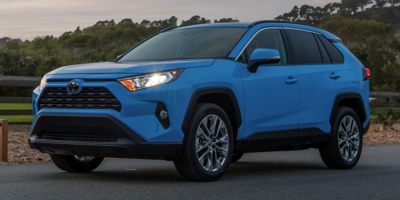 The 2019 Toyota RAV4 is available in 16 exterior colors, Blizzard Pearl, Blizzard Pearl w/Black Roof, Blue Flame, Blue Flame/Ice Edge Roof, Blueprint, Blueprint w/Black Roof, Lunar Rock, Lunar Rock/Ice Edge Roof, Magnetic Gray Metallic, Magnetic Gray Metallic w/Black Roof, Midnight Black Metallic, Midnight Black/Ice Edge Roof, Ruby Flare Pearl, Silver Sky Metallic, Silver Sky Metallic w/Black Roof, and Super White, and 4 interior colors, Black, Light Gray, Mocha, and Nutmeg.